More than four years after zipping down a steel cable to provide medical care to a chopped-up platoon of soldiers, Master Sgt. Roger Sparks still labors to make sense of that day in November 2010 when four men died in his arms. 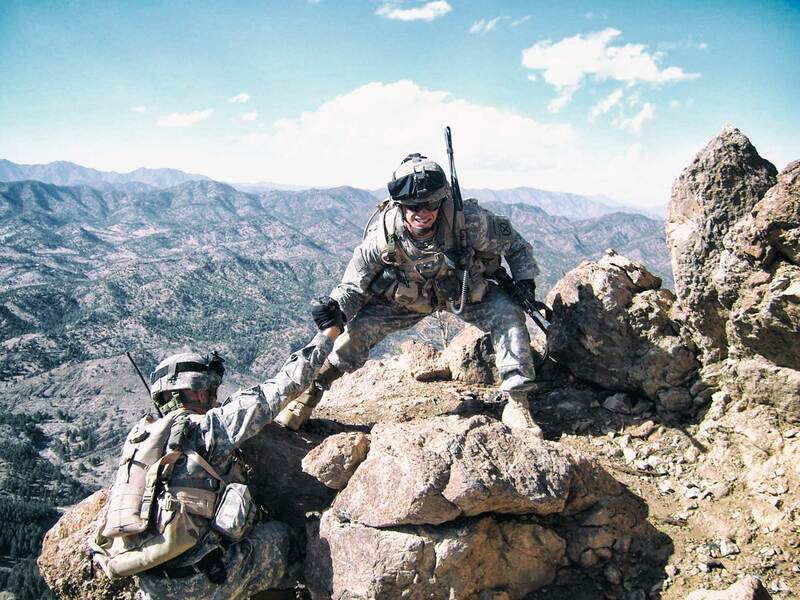 The lasting enormity of those hours on the side of an Afghanistan mountain was clear to the pararescueman soon after airlifting six soldiers from there to a field hospital. Upon landing at his forward operating base, he was greeted by tattooist Scott Campbell, who several days later inscribed on Sparks’ right forearm the date, time and coordinates of that recent firefight in Watapur Valley. The day’s events and grief so etched into his psyche are also forever stamped on his body. By and through tattooing, Sparks has found a form of catharsis. Now 41, Sparks, with the 212th Rescue Squadron of the Alaska Air National Guard 176th Wing, has spent his adult life in the military. As a boy growing up in the Fort Worth, Texas, suburb of Watauga, one of his father’s friends, a former corpsman with a Marine Corps squad during the Vietnam War, regaled him with stories — some about the men of the Corps’ Force Reconnaissance units. Despite prep work to pursue medical studies, Sparks joined the Marines after high school and aimed for a spot in the elite Force Recon. After two years in the infantry, he joined Force Recon, where he “did a lot of cool things, did a lot of crazy stuff,” including commando exchanges for the French Foreign Legion. For a decade, Sparks was deeply involved with Force Recon “hook, line and sinker.” He married his high school sweetheart, Jennifer, and their first son, Orion, was born in the late 1990s. Sparks felt his priorities changing. Then came Sept. 11, 2001. 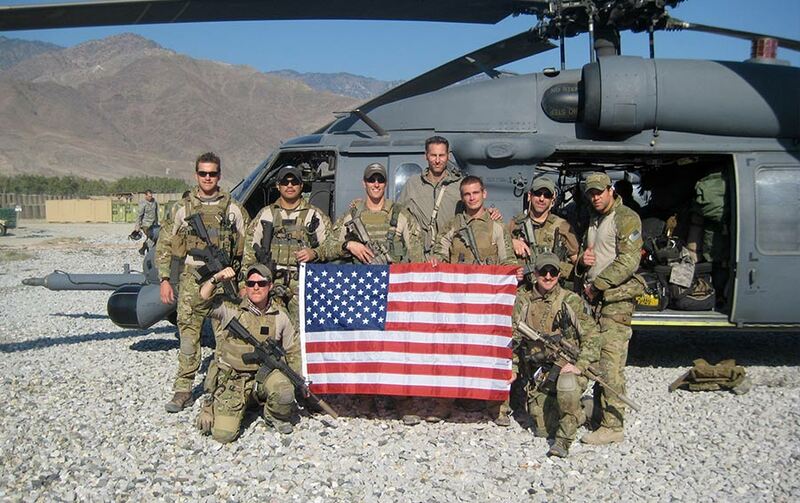 He trained to become a pararescue jumper, or PJ, with Air Force Special Tactics. The transition was a dark time in his life. An injury left him paralyzed below the waist, and he waited months for surgery. He performed CPR on his second son, Ozric, after he stopped breathing, a trauma that left the infant with a permanent brain injury. Sparks wasn’t interested in the “tactical tough guy” jumping that most PJs do, he said. “I wanted to do rescue at a very high level, and everybody knows the place to do that is up in Alaska.” He and his family moved there about 10 years ago. “We do one rescue a week on average up here, either jumping or bringing in the helicopters, doing real-world stuff here,” Sparks said. 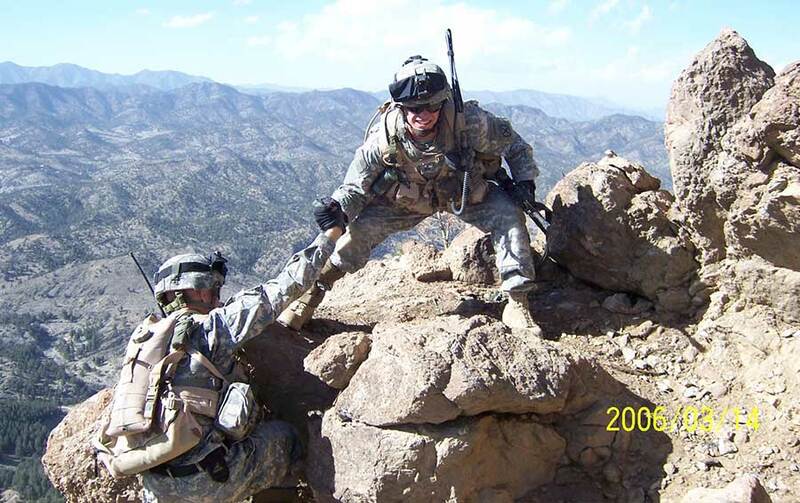 “It’s a great place to be a pararescueman … It’s a violent climate to live in, and it’s always trying to do you harm.” Sparks continued to be deployed to America’s post-9/11 wars as a PJ. In 2010 he was the senior enlisted man in charge of 12 PJs. They were stationed at Bagram Air Field but were prepositioned in forward operating bases during certain operations. “We’d sleep and live right on the edge of the battle space whenever there were kinetic operations going on,” he said. “We would fly directly into the firefights to get guys out who were wounded.” Everyone knew that Operation Bulldog Bite in November 2010 in Watapur Valley was going to be “hot,” Sparks said, describing that region’s converging valleys as “the Ho Chi Minh Trail of Afghanistan.” “But we’d done multiple operations like this without really too much grit. I’d been there five months. We’re always flying into the worst day of somebody’s life.” They were flying into fire to rescue wounded soldiers three to four times a day for the first four days of Bulldog Bite, in which U.S.-led forces patrolled down from 11,000 feet to the valley in a search-and-destroy mission for insurgent training camps. “You would sleep, eat, live and drink in your gear,” he said of the PJs. “We were completely blood-soaked and -stained, man. … So, basically, guys would do missions until they had the ‘10,000-yard stare’ and they were so grief-stricken that we gave them two or three missions to just recover, and another guy would come in for them. We were flying with five PJs total — three in the first aircraft, two in the second,” he said. 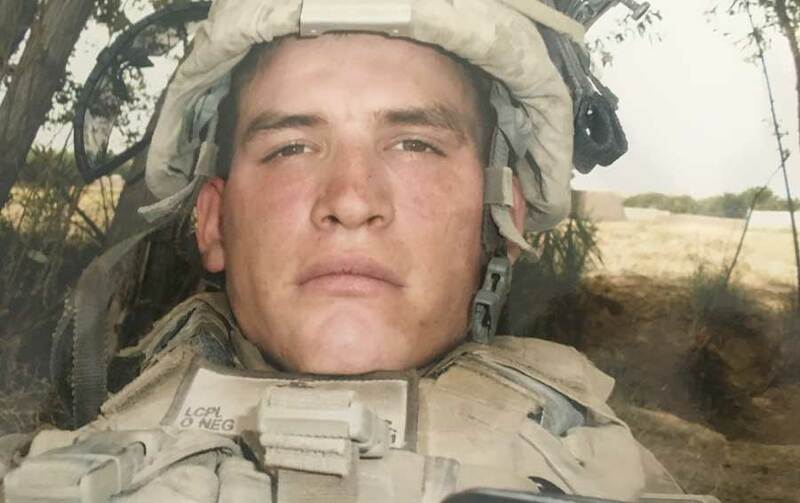 “We were in the fog of it, in that completely numb state of what we were doing when we got the call on Nov. 14.” Sparks said the voice on radio calling for medical rescue changed three times, meaning the first men had been wounded or killed. They took on extra fuel and ammo for the helicopters’ guns in anticipation, but it would be far from enough. As the helicopter Sparks was in hovered near the steep mountainside, trace fire tore through the cabin as the well-armed insurgents below let loose. Sparks and Capt. Koaalii Bailey, a combat rescue officer with the 83rd Expeditionary Rescue Squadron, 455th Expeditionary Operations Group, 455th Air Expeditionary Wing, were hoisted 40 feet down in a bear hug while clipped to a quarter-inch cable. The moment Sparks’ feet hit the ground an RPG round detonated about 20 feet away from Bailey’s back, and the force knocked them down and disconnected the cable. Sparks was disoriented but regained focus. He made his way up the steep incline, maybe 100 feet, toward soldiers he’d eyed by a mesquite tree in a ravine. Barely 10 feet away, an RPG round hit the tree and blew Sparks back down the incline. As he made his way back to the tattered tree, he saw that one soldier’s helmet had been ripped off, tearing open his jaw. Another man lay on the ground, shaking. Bailey called in four Hellfire missiles from nearby Apache helicopters, even though the soldiers were “danger close,” Sparks said. The missiles were followed by a 2,000-pound bomb. Because of the steep grade and ravine, the percussive force of the blasts didn’t kill them. Sparks would receive the Silver Star in July 2014 for tending to nine wounded soldiers that day, during which time he “feverishly triaged chest wounds, punctured lungs, shattered hips, fist-sized blast holes, eviscerated stomachs and arterial bleeders with limited medical supplies and only the light of the moon,” the citation states. Bailey would receive a Bronze Star with “V” device for valor; his citation said “his actions single handedly prevented further casualties and allowed the ground force to repel the overwhelming enemy onslaught.” Sparks was indifferent to the award, his enthusiasm rising instead with a series of coincidences after Nov. 14 — including meeting Campbell. Campbell had tattooed the names of Sparks’ two sons on his chest, and then, just as Campbell was about to leave the base after tattooing “nonstop” for a few days, Sparks asked him to ink the date, time and coordinates of the Nov. 14 experience. Sparks struggled with post-traumatic stress in the year after that five-month deployment, during which he turned to tattooing. “I couldn’t shake the catharsis of it, like how healing the experience was to be serendipitously tattooed right after that,” he said. “So I subconsciously started to recreate it by showing interest in tattooing myself.” His wife bought him a cheap kit, and he began tattooing as much of his leg as he could reach. He immersed himself in the lore of Japanese “irezumi” full-body tattooing: “It’s a metaphysical thing of attempting to master yourself through experiencing the pain of tattooing but through virtuous symbols.